I hope that everyone is enjoying the warm weather. I can safely say that it is FINALLY spring and we will soon be welcoming summer. Yay! I am also so ready to be home with my family for Easter, and hopefully it will be sunny and warm. This is always such a beautiful time of year, and being able to spend it with the people you love the most makes it even better. For today’s look, I’ll be sharing a trend that I absolutely love, which is the “polka dot” trend. From dresses, to skirts, to shoes, I am loving all of it. You can wear them all through spring and summer, and MAYBE even into the fall. And even if you can’t I am still going to. They are flattering on all body types, and even if you do not feel comfortable wearing polka dots on your clothing, you can accessorize with shoes, bags, and hats. So everyone can embrace the polka dot! Romper - I am wearing a size small, in navy blue, and the best part is that it is so versatile. You can wear it for brunch, date night, and even casual Friday, just pair it with a white blazer and heals and you are set for work. This romper comes in sizes XS - L.
Sandals - I am wearing a size 7 in white/gold. Jack Rogers truly have the comfiest sandals, and they go with everything. You can wipe them off, which is great, especially when living in the city. They come in a wide variety of colors and styles, sizes 6 - 10, as well as half sizes. The weather was BEAUTIFUL today, and I wish I could spend the whole day outside, but I guess I can settle for eating lunch outside taking a walk. I also saw that it looks as if this weather is here to stay, which brings a smile to my face, because I, for one, was sick of winter. Along with it finally starting to feel like spring, I was invited to an amazing event at Ann Taylor to launch their spring collection, filled with with bubbly water, cupcakes, photo shoots, and more. Who could ask for a better leap into spring. I had a chance to look at all the new spring fashions, and I know that you will not walk out empty handed. They have the perfect flowy dresses, and structured pants, that are sure to take your work wardrobe to a whole other level. For my look today, I’ll be sharing the “MUST HAVE” outfit that you will need in your closet. The best part? You’ll be able to keep both the top and pants for years to come, as they will never go out of style, and you’ll never need another pair of pants again. Blouse - I am wearing a size small petite in black,and not only is this shirt incredibly soft, but it looks great paired with jeans, or wide legged pants, or a skirt. This blouse washes well, and the best part is that it comes in regular and petite, and in sizes XXS - XL.. Clutch - We all know the struggle of finding the perfect clutch to carry all of our stuff. Most of the time they are so small that all we can fit in the clutch is a tube of lip-gloss and our ID. However, this clutch holds everything, from a mini wallet to THREE lip-glosses, glasses, and your phone. Talk about the perfect bag! Shoes - I am wearing a size 7, in black, and these shoes are not only comfy, but you can wear them all day and all night. From work to play they are the perfect fit. They come in sizes 5 - 11 as well as half sizes, and in two different colors. Does anyone else feel like winter is never ending? While the beginning of March always feels that way, I believe that this particular winter has just seemed on going with no end in sight. I just keep looking for the 10 day forecast where it says temps in the 50’s, but I guess we will still be waiting on that for another few weeks. But I am ready! We are about to hit that transitional period with the weather, where we go from wearing big heavy coats; to having no idea what to wear as far as coats go. If we wear the heavy parka, then we are sweating ,and if we only wear a wind breaker we are freezing! I have the perfect transitional outfit that you can pair with any jacket, and stay comfy all through the month of March, and even into April if the temps are still a bit chilly! Faux Fur Vest - A faux fur vest is a spring must, and it is something that we should all have in our wardrobe. You don’t have to spend a lot of money, as they have these vests in literally every store. They go with everything, and they are perfect for layering, if you do not want to wear a jacket. Jeans - I am wearing a size 26 petite, and Madewell jeans are truly my fave. I love that they button, as opposed to zipping, so they lay flat, and they are incredibly comfy. Pair them with a blouse, or sweater, and you are all set anytime of day or night! They come in sizes 23-33, and in petite, regular, and tall. Top with Bell Sleeves - Who doesn’t love adding a bit of 70’s vibes to their look? This top is so fun, and the best part is you can dress it up with a skirt for work, or be more casual like I did here by pairing it with jeans and velvet sneakers. This top comes in 5 different colors and sizes XXS-XL. I am wearing a size small. Velvet Sneakers - I am wearing a size 7. These sneakers are SO fun, and they add the perfect pop of color to any solid color ensemble. While they appear to be a bit heavy, they are actually quite lightweight. They are the perfect travel shoe because they provide the perfect amount of support, and if they get dirty you can wipe them off. They come in sizes 6 - 10 as well as half sizes. We all have those Saturday’s where the weather is miserable, we cannot go outside, and we end up feeling bored by noon. Well, that was my sister and I this past Saturday. My sister and I love to cook and bake. We get it from our mom and grandma, and of course being Italian, it is just naturally in our blood. Ever since I can remember, we’ve always been in the kitchen making fun recipes. Of course, we always make way too much, but again, being Italian it is in our blood haha. So, this past Saturday, we decided it would be fun to try out a new cookie recipe, and they came out great! Everyone loves Funfetti, from cakes, to ice cream, to breakfast, even coffee! I tried the coffee and it is not that good. Well, my sister and I decided to make funfetti cookies, except we put our own spin on the fun treat. Not only are they yummy, but they make for a perfect gift, and after dinner dessert when having guests over, or even when you have a late night craving. In a large glass bowl, pour half of the multi colored sprinkles and chocolate sprinkles into the bowl. Add white cake mix to the glass bowl, followed by two eggs and 3/4 cups of vegetable oil. Add the remaining sprinkles to the bowl, and mix one last time. Spray non stick spray on a large baking sheet, and with a spoon or ice cream scooper, scoop out the cookie dough and place on sheet. Using a spoon, or ice cream scooper will allow for the perfect shaped cookie. Leave cookies in over for 15 to 20 minutes until done. Am I the only one who thinks this week is dragging? I thought yesterday was Thursday! I think it is a combination of the cold weather, and lack of sunshine. But it is going to be 50 degrees over the weekend, and than 19 degrees on Monday…..oh my goodness we are going to FREEZE! haha. This just gets us one step closer to summer, but than we will complain that it is too hot! However, NYC really is hot and steamy in the summer, and not the sunny beach kinda hot, more like the standing behind the back of a bus kinda hot. So Monday will consist of bundling up, like our moms would do when we had a snow day and we could barely move to play outside. But hey, we were WARM. Speaking of when we were little, I remember when I was a little girl, my mom would always put bows and headbands in my hair. All kinds of headbands - glittery, leather, colorful, floral, you name it we had that style. I loved wearing them, and I was sad they went outta style when I got older. That was until Gossip Girl came on the scene, and Blair was always seen wearing them, and boom, they made a comeback. Well, I can now say that they’ve made a comeback yet again, and I will be sharing not only some of my favorite headbands, but how to style them as well. Gold Leaf Headband - From work to play, this headband can dress up an outfit. I wear mine to work, as it really ties the whole look together into a polished fashion. 2. 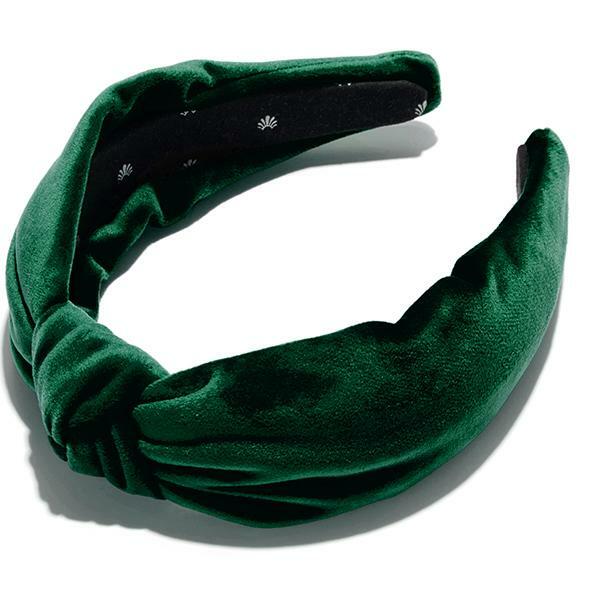 Velvet Headband - Brunch with the girls? Date night, or family gathering? Velvet headbands always have a very classic look, and I always wore them growing up, and still do on special occasions. They polish off any look, and they come in the perfect color palette - black, burgundy, green, mustard, and navy. 3. Chiffon Headband - They are the perfect casual Friday accessory. By Friday we are fed up doing our hair, and we just want simple and easy. No muss, no fuss. They also come in bright colors like hot pink, bright blue, and yellow. 4. Striped Wrap Headband - Running errands, afternoon movie, or just chilling with the family? This headband makes for the perfect denim companion. I love wearing them with jeans and a tee, or a sweatshirt and leggings. Instead of wearing a baseball cap, which I always wear, this just makes for a more polished look. They come in a wide variety of colors and patterns. Jeweled Headband - Perfect for a wedding, party, or anniversary dinner. These dainty headbands are sure to turn heads, and add that extra touch to complete your whole look. I hope that everyone had a wonderful weekend, and is all set to start a new week. The weather was quite nice this weekend, meaning I could spend as much time in Central Park as possible. I, for one, would love a mild winter; but I am sure that will not be possible. But hey, a girl can dream haha. My post for today will feature a favorite of mine, which is currently hanging up in my closet. I was planning on wearing it on NYE, but the stomach flu had other plans. However, I am taking that as a sign of good luck for the year of 2019. This velvet dress is not only the perfect date night dress, but it is great for dinner with the girls, and you can even wear it to work, by adding a blouse, or turtleneck, underneath. I am all for versatile outfits, and having less clutter in the closet. Velvet Dress - I am wearing a size small, in burgundy. While velvet can sometimes feel constricting, this dress easily moves, so you are comfortable from the moment you slip it on. This dress comes in sizes XS-L, and in three different shades. Block Heels - I am wearing a size 6.5 in Taupe. I typically wear a 7, but you have to go down a size in these heels. We are following the comfy theme, as these shoes are truly the comfiest heel in my closet. I was on my feet, all day, on Christmas Day, helping with dinner, and these were not only supportive, but my feet did not protest one time. They come in sizes 5-11, as well as half sizes. They also come in a wide variety of shades, including animal print. Plus, the taupe have glitter on the back, which is why I purchased that pair. Coat with Faux Fur Trim - I am wearing a size 4, and while my coat is from last year, I was able to find almost the same exact coat from Talbots. The coat comes in regular, petite, and misses; as well as black, heather grey and green. I am so excited to share with you babes something that I have been working on for the past few weeks, a collaboration with Ann Taylor! Just in time for the holiday season. 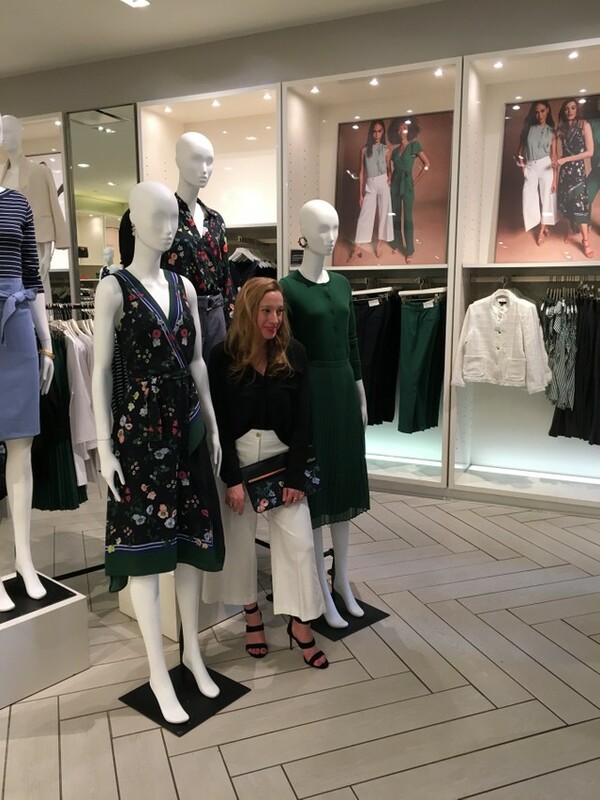 I did some fun shopping with my local Ann Taylor, here in the city, and I had so much fun! Who doesn’t love trying on clothes, and taking pictures in clothes that make you feel confident and fierce. 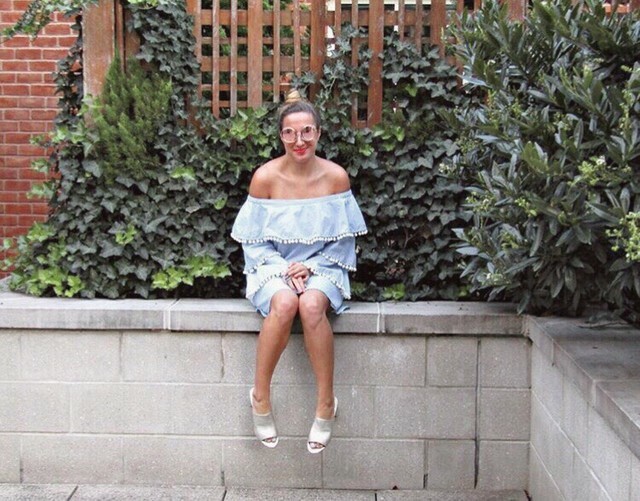 I’ll be sharing some of my favorite finds AND how you can wear them to holiday parties, date night, casual Friday at work, Christmas Day, and much much more! Lace Hem Skinny Jeans - I am wearing a size 2 petite, in classic black wash, and they truly are one of the comfiest pair of jeans that I own. Plus, they NEVER stretch out, and we all know we hate when that happens. You can dress them up with a blouse, sweater, or wrap top, like I did here. You can wear them on casual Friday to work, which I plan on doing this week, dinner with girls, or date night, and even a casual Christmas Eve dinner. They come in sizes 00-16, in both regular and petite, so everyone is sure to find a pair that fits perfectly. Thank God its the Weekend everyone! I hope everyone had an AMAZING Thanksgiving, with their loved ones, and ate tons of turkey and pie. I love Thanksgiving, as I always feel like Thanksgiving is the start of the holiday season. I must admit I have already decorated my apartment for Christmas, and when I came home after Thanksgiving at least 75% of my suitcase had Christmas sweaters, leggings, and holiday wear for the holiday season. Throughout December, I’ll be sharing some of my favorite Christmas gear, gift guides, AND a really exciting collaboration that I’ve been working on that I can’t tell you guys about just yet. I love oversized sweaters for the winter, they are cozy, comfy, and they go with almost anything. Oversized sweater - I am wearing a medium. I usually wear a small, but I love going up a size, so I can layer on top with a vest or leather jacket. The sweater comes in sizes XS-XL, and in 5 different colors. Jeans - I am wearing a size 26 petite. I am so happy that most stores carry petite size jeans! Finally! It was always such a struggle before, and I either needed to get them hemmed, or I’d roll them. So happy I do not have to do that anymore. These jeans come in sizes 24-32, and petite, regular, and tall. Booties - I am wearing a size 7, and these booties are so comfy. You can wear them to work, dinner with friends and family, and all that running around doing holiday shopping. They come in sizes 5-10, as well as half sizes. Holiday crossbody - I love everything festive during the holidays, from bags, to winter hats. Sadly, my bag is from last year, but I’ve linked two other bags that I know you’ll love. Thanksgiving has truly come out of nowhere. Halloween was only 3 weeks ago! While I am ready to spend time with my friends and family, I don’t feel like I have had enough time to prepare, or figure out what I am going to wear haha. However, comfy dresses are a must for Thanksgiving, meaning I can eat as much turkey, and pie, that I want. For today’s post, I am going to share some of my faves for this time of year. The weather still isn’t incredibly cold, so I tend to wear a heavier sweater, and light jacket. This way, if I am too warm, I can easily remove my jacket. I also get hot incredibly easily. Sweater - I am wearing a size small, in cream. This sweater is so incredibly warm, and cozy, that I never want to take it off. This sweater is perfect for layering, and it looks great with skinny jeans, or leathers pants. They come in sizes XS-L, and in several different colors. Slides - I am wearing a size 7, and while these are from last year, they are still selling them online! YAY! They come in a variety of colors, and in sizes 5.5 - 11. Have a wonderful beginning to the Thanksgiving holiday! I hope that everyone had a wonderful Halloween, filled with laughter, candy, and MORE candy. My sister and I gave out candy in our apartment building, and I was afraid that we’d run out of candy, as we had so many kids, but we had plenty to spare. Meaning, that we can eat the rest of it! It may take us until the summer, but it will get eaten haha. Now that it is starting to feel like fall, but you still do not want to wear a winter coat, vests are the perfect choice. They are perfect for layering, and keeping you warm, and cozy, on blustery days. From puffer vests, to fur vests, you can take your look from day to night, from casual to chic, all with swapping out one for the other. 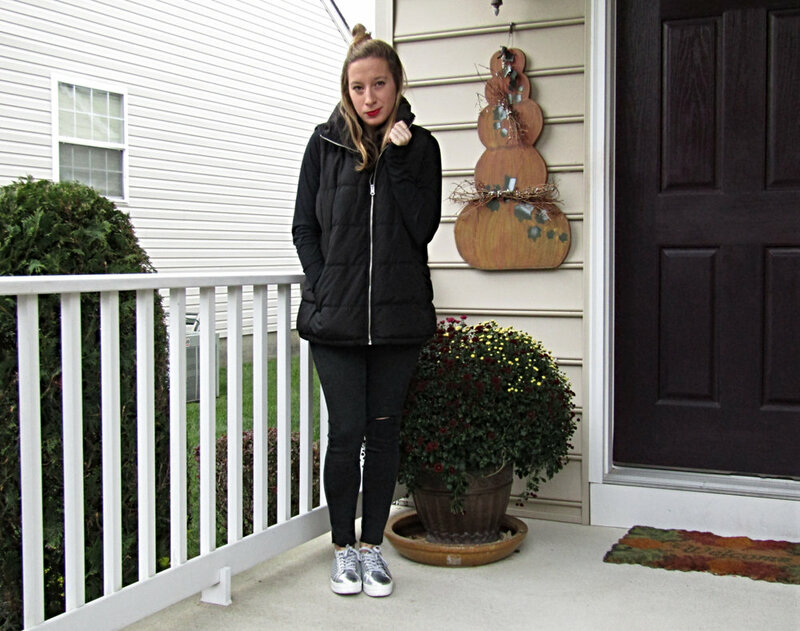 I’ve talked about fur vests on previous posts, and now I am going to share with you my favorite puffer vest for all those chilly fall days. Vest - I am wearing a size small petite. You do not need to spend a lot of money on a vest for the fall/winter. You can find plenty of inexpensive ones from Old Navy, Target, The Gap, etc. Mine is from Old Navy, and I’ve been buying vests from there for years. They are incredibly durable, and you can throw them in the wash. They come in sizes XS-XL, and in regular, tall, and petite. Top - I am wearing a size small petite in black. You can never go wrong with a comfy long sleeve tee, perfect for layering. This top comes in sizes XS-XL. Target always have the cutest, and comfiest, tops. Jeans - These jeans are truly the comfiest jeans in my closet. Three of my friends have already bought them, and they are OBSESSED. I love that they button, instead of zip, so they lay flatter. Plus, it is easier to tuck in a top or wear a sweater. I am wearing a size 2 petite, and they also come in regular, and tall, as well as sizes 0-18. Sneakers - Who doesn’t love a fun pair of sneakers? Not gonna lie, I love cute sneakers, slip on’s and slides (they are literally my “go too”) Ever since I got hurt 4 years ago, sneakers truly are the comfiest shoes that I own. These sneakers are incredibly supportive, and you can wash them off with a wipe, and they will look as good as new. They come in sizes 5-9, as well as half sizes, and in three different colors! I hope that everyone has a wonderful start to a new week! Does anyone else feel like we blinked, and September came to a close? Some months go by so fast, and others seem to drag……..I see you February. However, October through December is my absolute favorite time of the year, besides summer of course.! There is just something in the air, a sense of cheer and lightness, people are just happy. Probably because we have Halloween, Thanksgiving, and Christmas, within the next three months, which are my three favorite holidays. I just love spending this time of year with family and friends, ALL of the decorations, and pumpkin spice everything (even though I do not like pumpkin!) I know shocking! Now that temps are beginning to drop a bit, it’s the perfect time to share the best transitional look, that you can take from work to play! Talk about a win, win. Dress - I am wearing a size small, in olive. This dress is flattering on all body types, and is perfect if you are petite like me, because you do not need to get it hemmed! I feel like I hem more of my clothes than not. It is also the perfect dress for work. I pair it with gold, or tan, heals, and layered necklaces. Getting drinks after work or date night? Add the faux fur vest, and mules, and you are all set for a night on the town. This dress comes in sizes XS-XL and in a variety of colors. Faux Vest - A faux fur vest is a fall must, and it is something that we should all have in our wardrobe. You don’t have to spend a lot of money, as they have these vests in literally every store. They go with everything, and they are perfect for layering, if you do not want to wear a jacket. Plus, with the holidays right around the corner, I tend to wear these 24/7. Mules - I am wearing a size 7, and they truly are the comfiest mules that I own. They go with everything, and are sure to dress up any look. They come in sizes 5-13, as well as half sizes. 4 Best Places for Happy Hour in NYC. Finally the sun is shining, and the humidity is not as bad as it once was. When the sun is shining I feel like everyone is always in better spirits and happier. While I love rain, from time to time, it was becoming a bit depressing. Rain also never mixes well with Happy Hour, especially when it revolves around breathtaking views, like here in Manhattan. For today’s post, I will be sharing my 4 favorite places for Happy Hour, here in the city. I am not a big drinker, but I love going out with my friends after work, or when my family is in town, to Happy Hour. Not only is Happy Hour great for drinks, but they have some of the best views in town. The Empire Rooftop - Ok, we all know those iconic scenes, from Gossip Girl, with Chuck and Blair, and let’s be honest we’ve all wanted to have our own Blair Waldorf moment. The rooftop bar is perfect for a quick drink and bite after work, a date, and a night out with family. The views are stunning as you look out over Lincoln Center, and the Met, and the busy, bustling, streets below. They also keep the rooftop open in the winter. They add heaters and covering on the outside decks. They have a fantastic brunch, all under $20, and fantastic Bloody Mary’s. When coming after work, we usually split food, as the portions are big and the drinks are great! Monarch Rooftop - The Monarch is Midtown’s chicest rooftop lounge, with truly the most stunning views of the city. The Monarch overlooks the Empire State building, and the vibrant, bustling city streets below. During the day the city is beautiful, but once the sun goes down the city becomes alive with bright lights, and you have no better views of all of Manhattan than right here. This rooftop bar is not as intimate as The Empire, and gets quite busy fairly quickly, so I would recommend making a reservation. The food and drinks are great, a little pricey, but you do really pay for the view. 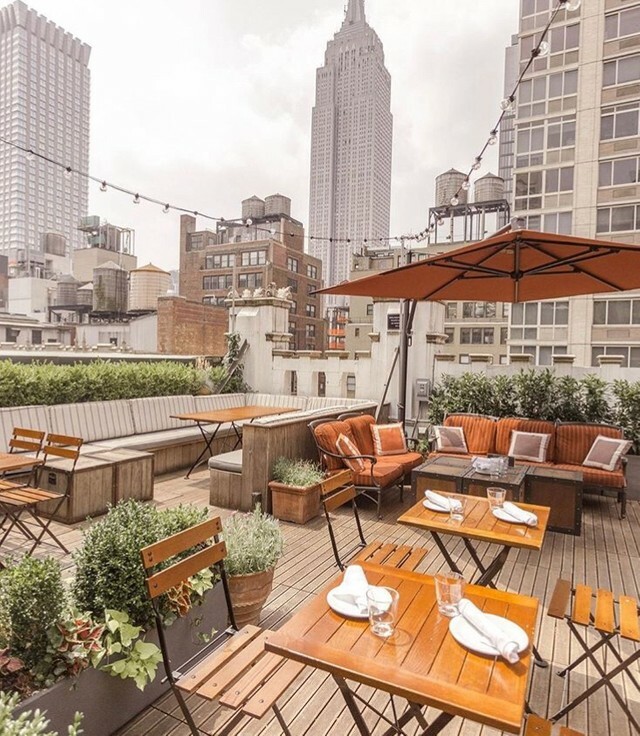 The Refinery Rooftop - Located at the top of the Refinery Hotel, it truly is one of the coolest rooftops in Manhattan. This rooftop is encased in glass, and at night the combination of the view and the lights is stunning. They have some of the funkiest drinks, and not only are they fun, but they make for a great photo op. I always recommend getting the Lobster Tots, or the Fresh Mozzarella Flatbread. PLEASE NOTE - Guests under the age of 21 are not permitted on the rooftop past 6 p.m. Mondays-Saturdays. They are allowed on the rooftop for lunch ,and on Sunday afternoon and evening, as long as they are accompanied by an adult. St. Cloud Rooftop Bar - Located at the top of The Knickerbocker, in the heart of Time Square, this is a magical place to stop by for a drink. Before I moved here, we would come to the city, and we always stayed at the Knickerbocker. We’d always come here for it’s spectacular views of the city. Stop by before, or after, a Broadway show, or dinner, and you are sure to have a wonderful time. They have incredible parties around the holidays, and I’ve heard their New Year’s Eve Party is spectacular. Plus, you get a front row seat of the ball drop and fireworks, minus standing in large crowds below. Talk about a win, win. When it's 105 and You're Wishing for Fall. I hope that everyone had a wonderful weekend, and enjoyed the cooler weather. Here in the city, the weather went from 90 degrees to 65 degrees, in less than 72 hours, and I'm not going to lie, I will gladly take the reprieve. I always feel like this is the time of year where the weather goes from one extreme to the next, and flip-flops from hot to cold, and hot again. This makes it hard to shoot photos, because no one wants to wear jeans and a sweater when it is a million degrees outside haha. When I shot this look it was 105 degrees, CRAZY! However, you find ways to make it work. For today's look, I will be sharing the perfect transitional look from summer to fall. Halter Top - I am wearing a size medium, which is perfect when you have a larger chest but are petite, as a small would be too tight across the chest. This halter is perfect for both work and for the weekends. For work, I pair this scalloped top with a high waisted, flowy skirt, or ankle length pants and heels. For fun and the weekends, I pair the top with a leather skirt, or jeans, and add a pair of booties and a leather, or denim, jacket. The top comes in XS - XXL, and in three different shades. Leather Skirt - I am OBSESSED with this skirt. I am wearing a size 2, and this is truly the comfiest skirt in my closet. It also goes with everything and can be worn in all seasons. I even wear this skirt to work, just pair it with a blouse, sweater, or a ribbed turtleneck. Add a pair of heels and pearls, and you are ready to conquer your work day. This skirt comes in sizes 0-12. Is everyone gearing up for Labor Day weekend??? So ready! I love being able to spend time with my family and friends, grilling, and just having a good time. I know it calls for rain, but that's ok. It doesn't mean you still can't have fun! For today's look, I'll be sharing the perfect look for fall. I know that we all get those style magazines that say that you need to wear this, this, and this, in order to be on "trend" for the upcoming season, but we all have different tastes. This look is sure to be geared to everyone's unique style. Striped Blouse - I am wearing a size medium, in mustard. This blouse is perfect for fall, and it is perfect for every occasion, from work to play. Plus, this color is perfect, and looks great on everyone. The blouse comes in sizes S-L, and in three different shades. Denim Shorts - I am wearing a size 26, and guys these jeans are SO COMFY that I could wear them 24/7. They look great on everyone, and they are super comfy and easy to wash. These shorts come in sizes 23-32. Velvet Mules - I am wearing a size 7, and these slides are literally my FAVORITE. They are perfect, not only for the fall, but they are great through the winter as well. They come in sizes 6-11. I feel like I may be one of the only people who likes Thursdays. I mean, if you look at it positively, we are at the halfway point of the week! Meaning, we are one day closer to the weekend. Plus, Thursdays are the perfect day to get ice cream, or a beer, or both ice cream and beer, to perk you up for the rest of the week. So a win, win all around. 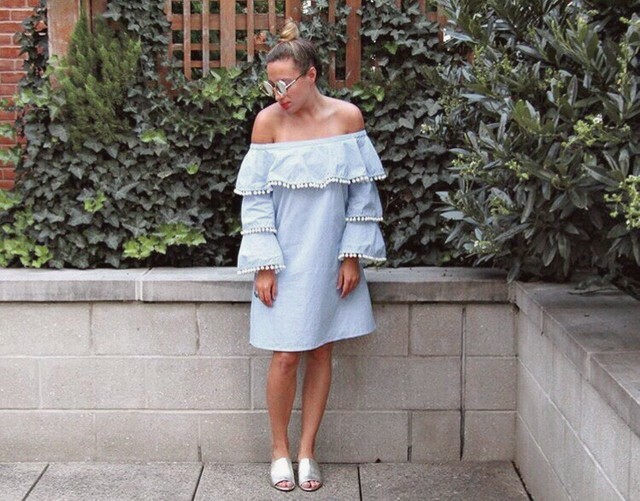 For today's blog, I am sharing two of my summer favorites, which you will also be able to transition into the fall. YAY! Shirt Dress - I am wearing a size medium, in Blue and White striped. I tend to wear a small, but I would buy a size larger with this dress, as it is very short. I wanted a little bit of length, so I did not feel like I was leaving my house in a shirt only. haha The shirt dress comes in sizes S-L and in three different colors. Keds - I am wearing a size 7, and I must say that Keds has been my favorite brand of sneaker since I can remember. Not only are they comfy, but they last forever, and you can have any style and shade under the sun.